Vientiane is NOT a major travel hub and can be costly to fly into. Many carriers, however, offer deep discounts 90 days or more prior to departure date. Think twice before booking a flight to Bangkok or Udon Thani (Thailand) with the intention of taking land transport the rest of the way to Vientiane. If you have plenty of time and want to go this route for the experience, by all means, do it! 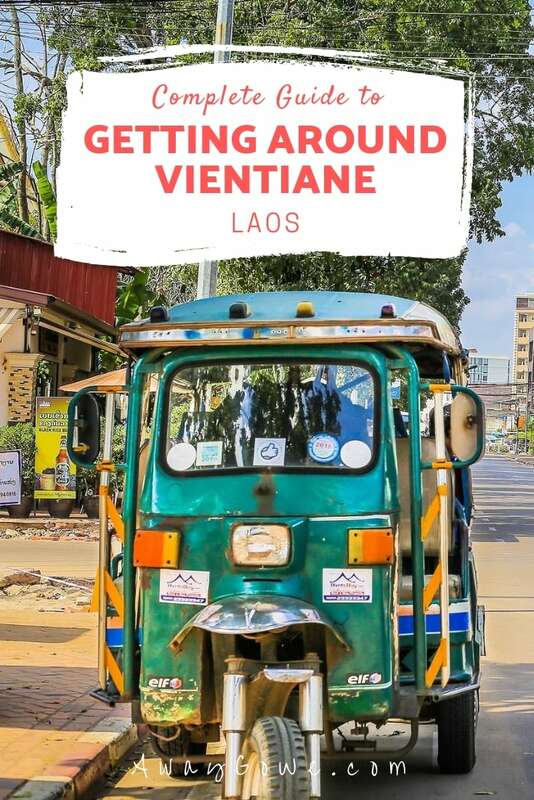 If you’re short on time and want to go this route simply to save money, it may very well end up costing you more money than flying into Vientiane, not to mention costing you valuable time. As of February 2017, getting a visa on arrival at Wattay International Airport is quick and painless for most nationalities. For U.S. citizens, you just need to bring your passport, a passport size photograph, the paperwork you receive on your incoming flight, and the visa fee in U.S. currency (USD). Currently the fee is US$35 for U.S. citizens. There are regularly scheduled overnight trains from Bangkok to Nong Khai, Thailand (just over the Friendship Bridge from Laos), from which you can catch a shuttle train over the bridge/Mekong/Laos-Thai border to Thanaleng Station in Laos. Unfortunately, Thanaleng Station is 14 miles from downtown Vientiane — but, there are shared minivans at the station to take you the rest of the way. We’ve found the Thai sleeper cars to be very comfortable and a good value for the money. Vientiane has three major bus stations. For destinations in Vientiane Prefecture (such as Buddha Park) most buses currently leave from behind the old Kua Din bus station (near Talat Sao / Morning Market). Northbound intercity buses (Veng Viang, Luang Prabang, etc.) leave from the Northern Bus Station just north of the Wattay International Airport. Southbound intercity buses (Thakhek, Savannakhet, etc.) leave from the Southern Bus Station, about 7 mi. northeast of town, naturally. Currently, only a handful of carriers have regularly scheduled international non-stop service to Wattay International Airport. Cities with nonstop service include Bangkok (Thailand), Hanoi & Ho Chi Minh City (Vietnam), Kunming & Nanning (China), Kuala Lumpur (Malaysia), Seoul (South Korea), Siem Reap & Phnom Penh (Cambodia). The primary airline companies that operate out of Wattay International are Lao Airlines, Lao Skyway, Thai Airways, AirAsia, Bangkok Airways, Cambodia Angkor Air, China Eastern Airlines, Jin Air, Sky Wings Asia Airlines, T’way Airlines and Vietnam Airlines. Transport to/from the airport and bus stations is straightforward. At the airport, visit the Taxi desk near the front doors to arrange an official taxi to any place in town. In terms of getting to the airport or any of the bus stations, your guesthouse can easily arrange a pick-up, or you can flag down a tuk-tuk or songteau at any of a number of points downtown. Oddly, we’ve consistently had to pay more for tuk-tuks and songteaus than taxis, so keep in mind that a taxi may be the cheapest option for a private hire. If you’re only in Vientiane for a few days and staying downtown, you won’t need to worry much about transportation. The majority of the city’s best eats are concentrated downtown in a four-block corridor along the Mekong. Some of the cities more major attractions, such as Wat Si Saket, That Dam and the Lao National Museum, can also be easily accessed on foot. Vientiane is one of the few major cities in Southeast Asia that doesn’t yet have a comprehensive public transit system. With the exception of taking the #14 bus from Kua Din station to the Lao-Thai Friendship Bridge or Buddha Park, the public bus and songteau routes that do exist are not easy to figure out for those with minimal Lao language skills. However, there are still several options for getting around outside the city center. For seeing sights further afield, tuk-tuks and songteaus are common throughout the downtown area, but are far more costly than Thai cities, and individual trips can quickly add up if you are trying to see a lot outside of the city center. A smarter idea may be to hire a taxi or tuk-tuk through your guesthouse for a set number of hours if you plan to be moving around a lot. Renting a bicycle is also a great option for getting around downtown, and bicycles can be rented from a number of guesthouses in the city center. Bicycling can also be a great way to see farther off sights, such as Patuxay and That Luang, but many visitors may feel uncomfortable riding in Vientiane traffic, particularly around rush hour. Sundays are generally a great day for bicycling throughout the city. Depending on your plans during and after your visit to Vientiane, renting a car may be a better choice. A few major rental car companies have offices at Wattay International Airport. We’ve found that Budget generally has the best rates. If you’d rather have your transport planned out and see as much as possible in a short amount of time, there are opportunities to join a group or private city tour (see the section below for more details). We’ve heard good things about Tuk Tuk Safari, but have never utilized their services, ourselves. There are also rumors of a new Hop-On-Hop-Off bus, but details are sketchy at present. Check back for updates! As mentioned above, we’ve consistently had to pay more for tuk-tuks and songteaus than taxis, so keep in mind that a taxi may be the cheapest option for a private hire.